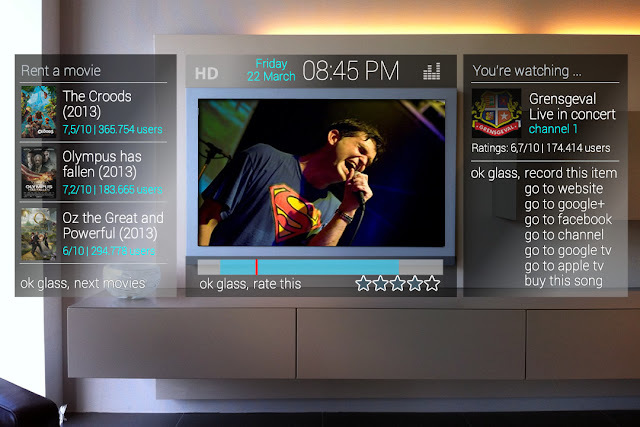 Imagine that with Google Glass you are able to expand your TV with additional screens with relevant information on the program that you are watching. You will be able to operate your TV, with all the features you already have with the remote, hands-free and via voice control while you do not have to change your screen image, at the same time you can continue watching the broadcast in full size. check if new videos have been uploaded to YouTube channels you've subscribed to. When a website or Google+ profile is provided on a TV show, movie, music video, concert, political party, news item or of the participants, it can also be viewed on your TV right away. For consumers, who use their PC or laptop 90% of the time for entertainment, online banking or to request information, you can even question whether a TV with Google Glass will be sufficient. In short, advertisers will be able to reach their goal immediately provided that the right approach is used. Big brands will (whether or not grouped) establish new TV channels as online sales channels taking into account that the current players will not react in time. 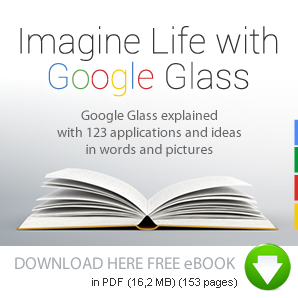 Google Glass, which will initially be connected to a smartphone via Bluetooth for internet connection, will only have to be able to automatically identify the edges of the screen so that the virtual screens can be placed around them in the right proportions, and from your perspective.